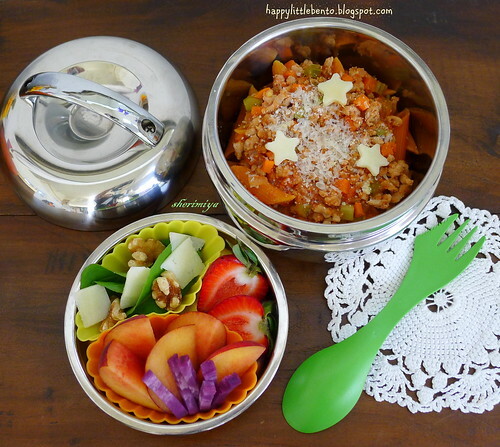 Starry Penne with Meat Sauce Bento, a photo by sherimiya ♥ on Flickr. I picked up this apple shaped bento box in an Asian housewares store on Clement Street in SF, I think... it was a long time ago, and there isn't a brand name on it so I can redirect you. Sorry! It's a cool box, but there are other similar ones you can find at bentoandco.com, and jlist.com. Hope this helps. And thanks a lot for reading! !